Ms. Desautels is Vice President of Brokerage Sales at First American Insurance Underwriters, Inc., Needham, Mass. A former Olympic athlete, she has 25 years experience in the life insurance field. She can be contacted at 800-444-8715 or [email protected]. 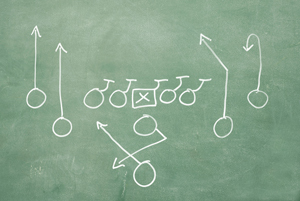 Much like a quarterback approaches a contest with a full game plan in mind rather than a single play, so, too, should a broker working on a large case see it as a multi-stage process. First, you will meet with the client to do the fact-finding and discuss goals and objectives. During this fact-finding process, product options and health issues may be discussed as well. If a red flag arises regarding a health issue, brokers must pay special attention to this detail as they proceed with the answering process. It is very helpful to identify potential underwriting challenges like this early in the process. This will factor into the process of deciding which carriers to apply with down the line. The top medical challenges we see on a regular basis are coronary artery disease (CAD), cancer, and diabetes. Where each is concerned, it is essential for you to learn the date of the diagnosis, details of the treatment, care path or surgical procedures undergone, and any pertinent test results such as EKGs for CAD applicants, cancer stage or grades, and blood glucose and Glycohemoglobin A1C results for diabetics. You should also obtain the names and contact information for those who performed treatments and tests. In addition to gathering a medical history, a client’s lifestyle can be an important factor. As we all know, underwriting is not always an “exact science.” Many times the underwriter will be on the bubble or have a range in mind when he or she reviews the paperwork. If the broker can supply additional information that is not on the attending physicians statement and not included in the test results, such as lifestyle information, this can sometimes make the difference between Standard and Preferred or Standard and Table Rating. An example of helpful information that might be included in a detailed cover letter with the application would be: “The client walks four to five times a week, and has a regular golf game two times a week.” This type of information illustrates that the client leads a very healthy and active lifestyle. It helps position the case in the best possible light and paints a favorable picture for the underwriter. Once the fact-finding is complete, the next step in the process is to determine which companies you will apply to. This becomes an even greater challenge given that, as we all know, handed the same set of facts, not all companies will make the same underwriting offer. But how can this happen? There are certain insurance companies that have a track record of doing a better job with certain health histories, which translates into more favorable offers for the client. Some offer better rates for cardiac risk, others cancer history, and still others elevated PSA levels. Carriers with the same set of information can range from a Standard rating all the way to a Table 6 for the same patient. This wide variation in offers occurs frequently in the large-case marketplace. Retention limits, which come into play when a large face amount is being sought, must be considered when determining a carrier. Retention limits will differ between carriers depending on their size, type of product being sought, applicant’s age and mortality risk. A company can also automatically bind business in the reinsurance pool based on its own mortality guidelines without sending the file to the re-insurers. These auto-binding limits can be as little as $500,000 or as much as $50,000,000 depending on the company. Factors that reduce these limits are: age, mortality risk, and risk type such as aviation or foreign travel. Also factoring into the decision are jumbo limits, which are the sum of all in-force coverage pending, regardless of what is being placed or replaced. These limits can approach $65,000,000 with certain companies and for certain age categories. It is important when a case is being put together to have a clear understanding of retention limits, auto-binding limits and jumbo limits. If a game plan is not in place there is the potential for gridlock in the marketplace. This can prove to be a major stumbling block in securing the needed coverage if the broker is not aware of these issues. The re-insurance marketplace has been shrinking over the last few years. This is a trend that will likely continue, making it more difficult and critical to understand how to piece together large blocks of coverage. Another consideration when working on a large case is what products should be involved? What needs and objectives is the client/broker hoping to achieve? This may mean multiple product solutions ranging from 2nd to die products to combination products. Combination products – a recent development has been, that many companies are now offering combination products. This is an individual policy with a long-term care rider. The idea is to create a pot of money that can be used for either the long-term care benefits or the death benefit, or some combination. As individuals get older, the need for long-term care planning potentially increases – this product can start to address those concerns and provide peace of mind. In many complex large cases, multiple product solutions need to be used. Brokers constantly need to keep up with the ever changing landscape of products in the marketplace for their clients. The cover letter gives clear direction to the case, and answers many of the questions that would have gone back and forth between the underwriter, the brokerage office, and the broker. As a broker, you must avoid taking a scattered “shotgun” approach to the large case; there’s too much potential for gridlock in the reinsurance market. When writing a large case, you need to work with the carriers and anticipate the factors that will yield favorable underwriting considerations based upon the particular medical history, financial ratings, and product competitiveness. A clear game plan and knowledge of the underwriting process is critical to getting a large case completed successfully for the client, as well as for you.